Active macrophages. 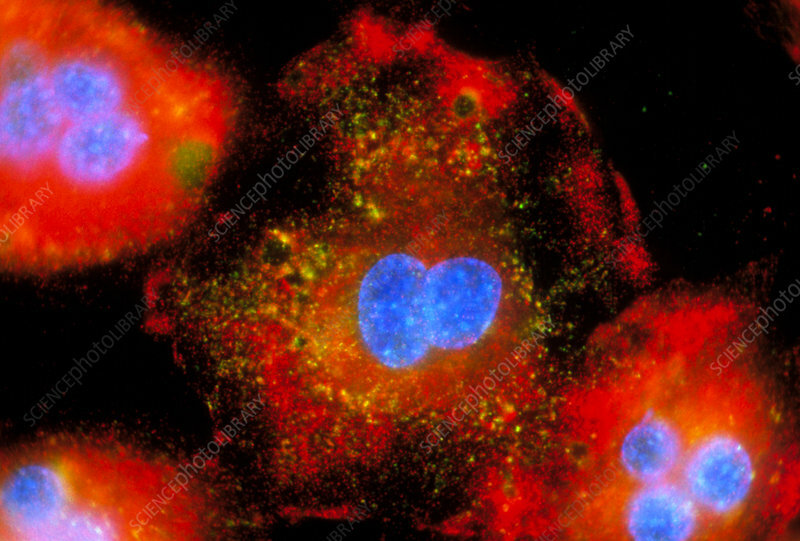 Immunofluorescent light micrograph of active macrophage white blood cells producing cytokine proteins. The cells have multiple nuclei (blue). Vaults are red and TIA-1, a protein which stops cytokine overproduction, is yellow/green. Cytokines are released by one cell population in order to influence another. If too much cytokine has been made, TIA-1 stops its production by binding to the mRNA (messenger ribonucleic acid) that codes for it, forming stress bodies (yellow). These macrophages have been activated by exposure to a mock bacterial infection. Macrophages help to kill invading organisms. Magnification: x200 at 5x7cm size.